Associated Press photos George H.W. 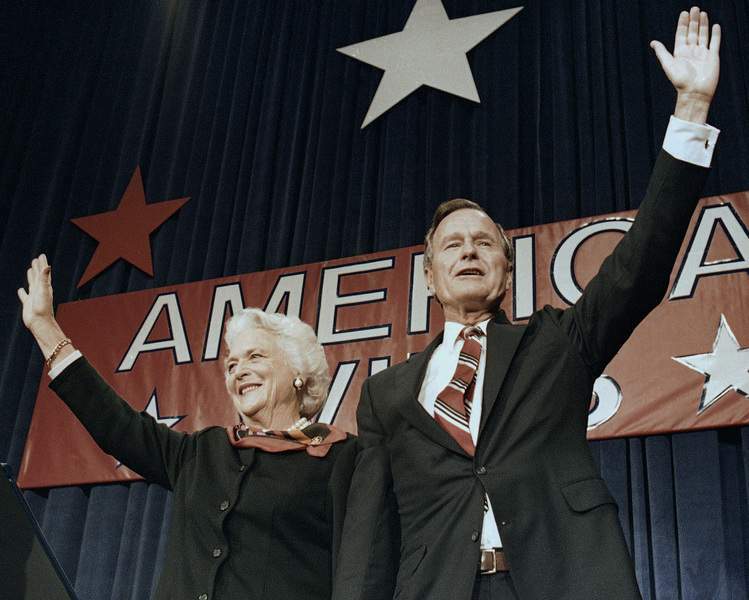 Bush and his wife, Barbara Bush, wave to supporters in Houston after he won the presidential election Nov. 8, 1988. The former president died Friday night at age 94. President George H.W. Bush holds a news conference at the White House where he condemned the Chinese crackdown on demonstrators in Tiananmen Square. 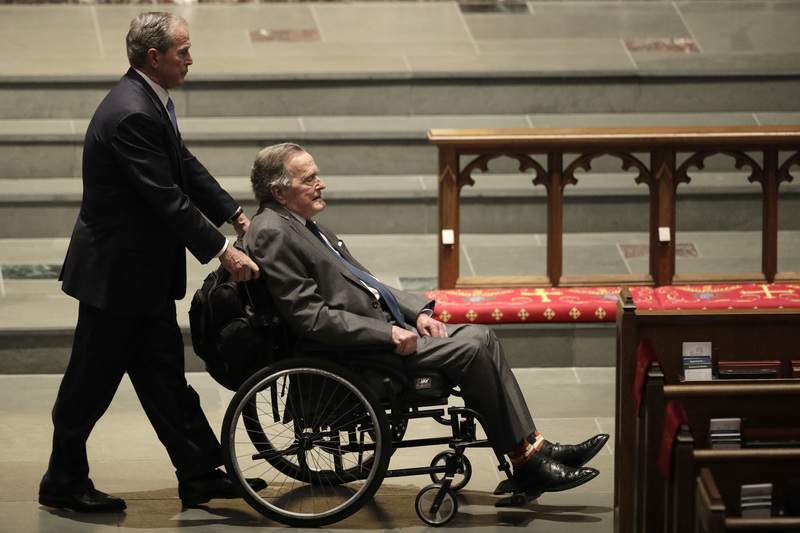 Associated Press Former President George W. Bush and his father, former President George H.W. Bush, arrive for the funeral of former first lady Barbara Bush in April. His death, at 94 on Friday, marked the passing of an era. Although Bush served as president three decades ago, his values and ethic seem centuries removed from today's acrid political culture. His currency of personal connection was the handwritten letter – not the social media blast. Despite his grace, Bush was an easy subject for caricature. He was an honors graduate of Yale University who was often at a loss for words in public, especially when it came to talking about himself. Although he was tested in combat when he was barely out of adolescence, he was branded “a wimp” by those who doubted whether he had essential convictions. This paradox in the public image of Bush dogged him, as did domestic events. His lack of sure-footedness in the face of a faltering economy produced a nosedive in the soaring popularity he enjoyed after the triumph of the Persian Gulf War. In 1992, he lost his bid for a second term as president. His death was announced in a tweet by Jim McGrath, his spokesman. The cause was not immediately available. In 2012, he announced that he had vascular Parkinsonism, a condition that limited his mobility. His wife of 73 years, Barbara Bush, died April 17. The afternoon before his wife's service, the frail, wheelchair-bound former president summoned the strength to sit 20 minutes before her flower-laden coffin and accept condolences from some of the 6,000 people who lined up to pay their respects at St. Martin's Episcopal Church in Houston. Bush came to the Oval Office under the towering, sharply defined shadow of Ronald Reagan, a onetime rival for whom he had served as vice president. Over the course of a single term that began Jan. 20, 1989, Bush found himself at the helm of the world's only remaining superpower. The Berlin Wall fell; the Soviet Union ceased to exist; the communist bloc in Eastern Europe broke up; the Cold War ended. Bush's presidency was not all plowshares. He ordered an attack on Panama in 1989 to overthrow strongman Manuel Antonio Noriega. After Iraqi dictator Saddam Hussein invaded Kuwait in the summer of 1990, Bush put together a 30-nation coalition – backed by a U.N. mandate and including the Soviet Union and several Arab countries – that routed the Iraqi forces with unexpected ease in a ground war that lasted 100 hours. However, Bush decided to leave Hussein in power, setting up the worst and most fateful decision of his son's presidency a dozen years later. In the wake of that 1991 victory, Bush's approval at home approached 90 percent. It seemed the country had finally achieved the catharsis it needed after Vietnam. A year-and-a-half later, only 29 percent of those polled gave Bush a favorable rating, and just 16 percent thought the country was headed in the right direction. That he was perceived as lacking in grit was another irony in his life. His was a character that had been forged by trial. He was an exemplary story of a generation whose youth was cut short by the Great Depression and World War II. The Regan-Bush ticket won in back-to-back landslides in 1980 and 1984. Once elected, Bush maintained a relatively low profile as vice president – chairing a number of task forces, offering counsel on foreign policy – while sharpening his bona fides and his political organization. Bush was barely brushed by Iran-contra, the major scandal of the Reagan presidency. He said he had been “out of the loop” when decisions were made to sell military equipment to Tehran to gain the release of U.S. citizens held hostage by pro-Iranian terrorists in Lebanon. This was contrary to Reagan's declared policy of never dealing with terrorists. The profits from the sales were used to provide aid to the anti-communist contra rebels in Nicaragua, which was a violation of U.S. law. Bush won the election with 53 percent of the vote over Massachusetts Gov. Michael Dukakis. He carried 40 states and received 426 electoral votes. He was the first sitting vice president elected to the nation's highest office since Martin Van Buren succeeded Andrew Jackson in 1837. As president, Bush worked long hours and had a penchant for detail. Fred Malek, his campaign manager in 1992, described him as “a guy who wanted to do everything well.” But in stark contrast to his predecessor, Bush failed to articulate an overarching view of the principles by which he governed. Bush espoused generally conservative economic and social programs: lower taxes, regulatory reform, more support for commercial development and access to foreign markets. He negotiated the North American Free Trade Agreement with Canada and Mexico, a measure that was ratified by the Senate in President Bill Clinton's first term. Bush supported voluntary prayer in public schools and adoption rather than abortion. He also supported gun owners' rights. Faced with Democratic control of both houses of Congress, Bush followed what became known as his “veto strategy.” In all, he vetoed 44 bills. Ten of them were intended to ease restrictions on abortions. The others concerned various regulatory, tax and spending measures. All but one of his vetoes – of a bill to regulate the cable television industry – were sustained. One of Bush's more impulsive selections was his choice of Dan Quayle, the junior senator from Indiana, to be his running mate in 1988. He made the move without consulting his closest aides, leaving his campaign unprepared for what followed. There were immediate questions about Quayle's service in the Indiana National Guard during the Vietnam War. He also attended law school at Indiana University during that period. Critics noted that he had never practiced law and suggested that he had used the Guard to avoid the draft. Quayle never fully laid to rest those questions or the broader doubts about his qualifications for stepping into the presidency. While the vice president earned high marks as the administration's emissary to conservatives, Bush wrote in his diary that he “blew” the decision on Quayle in 1988. But in 1992, he refused to replace him on the ticket. Bush made two nominations to the Supreme Court. : federal appeals judges David Souter and Clarence Thomas. 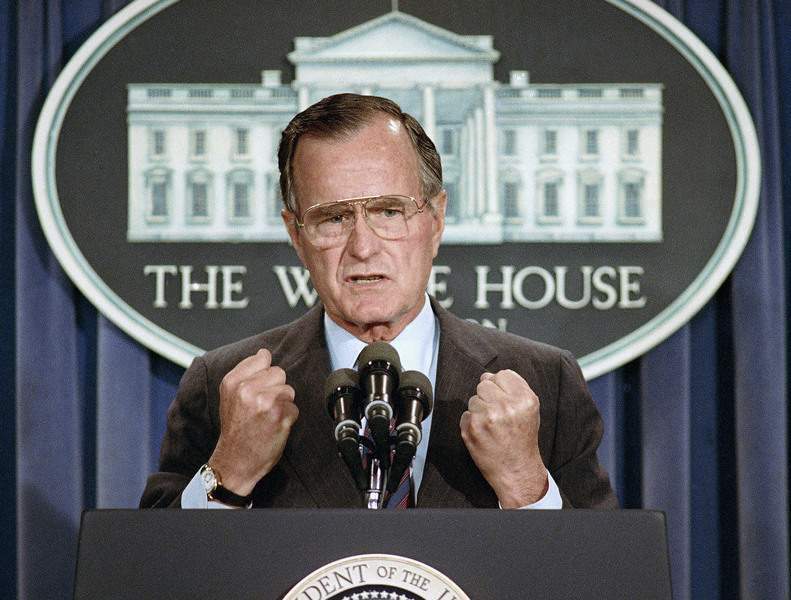 In November 1992, Bush was defeated by a relative newcomer to the national scene, then-Gov. Bill Clinton of Arkansas, whose campaign took as its major theme, “It's the economy, stupid.” In a three-way race that included independent candidate Ross Perot, Clinton received 43 percent of the vote, to Bush's 38 percent and Perot's 19 percent. Eight years after Bush moved out of the White House, however, he and Clinton were on a platform together at a presidential inauguration at the U.S. Capitol – this time at the swearing-in of Bush's eldest son, George Walker Bush, as Clinton's successor.